You react quickly, spinning your exo-armor around and raising your right arm to align the targeting crosshair with the most likely vector of your rapidly moving opponent. Your massive battle machine mimics your action, its arm-mounted massdriver spewing out a barrage of hypervelocity slugs. A bright explosion in the distance - one down, one to go! Better end this fast, you think: the gauge on your reaction mass tank is already in the red. But you're not worried; you're the best pilot of the Confederation, after all. The Jovian Chronicles recount the stories of one possible future, a time in which Mankind has expanded and settled the solar system, going as far as terraforming Venus and Mars. The Chronicles introduce a complete science fiction universe for roleplaying and tactical space combat, featuring giant spacecraft and epic space battles. The game features a blend of action/adventure and hard-science space colonization facts. Although the books are not intended to be big engineering manuals, they remain chock-full of the amazing yet plausible technical details that are so much a part of realistic science fiction settings. All those fascinated by the wondrous concept of space colonization will find more than enough to satisfy them in the Jovian Chronicles. 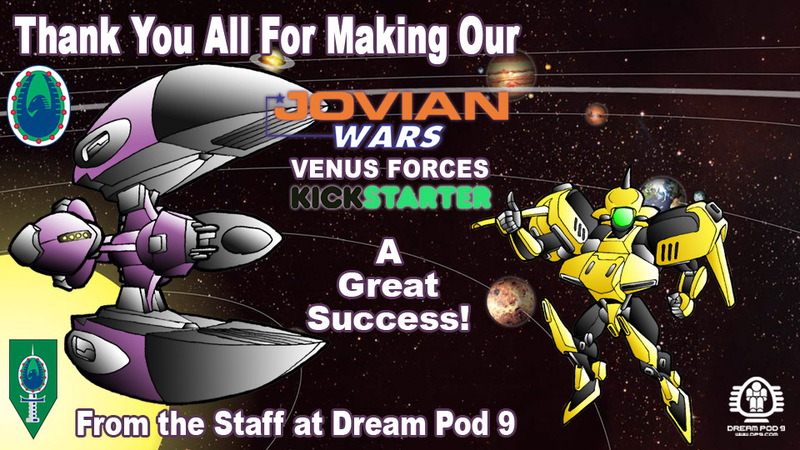 Jovian Chronicles is based on the Silhouette game engine, a streamlined, easy-to-use set of rules that is already described in Heavy Gear, Dream Pod 9's other highly successful science fiction game (see the Silhouette section of this Web site for more details). Depending upon your gaming group's preference, the Chronicles can be played as either a roleplaying game, a tactical board game, or a smooth integration of both. Roleplayers can easily ignore the tactical sections of the rules, if preferred. To help newcomers get a better picture of the Jovian Chronicles, here are a few tidbits of information that paint a rough portrait of this great science fiction saga. Fasten your seat belts - we&'re boosting out of orbit right now! The strike carrier thundered ahead, its massive hull gleaming in the light of the distant Sun. Its companions were spread out in a loose attack formation, ready to cut a swath through CEGA's massed fleet. "Stay alert, people -- they know we're coming." The captain secured the seal on his pressure suit and dropped his hand to the seat beside him, resting it on the reassuring smoothness of his helmet. "Come on. . . where are they?" "Launch flash! Missile launch confirmed, captain. We're getting a fix on the launching ship - "
"Captain, I'm reading several bogeys twenty clicks off our port bow", said the tactical officer. "Fighters?" replied the captain, his biting tone showing his annoyance at this unexpected turn of events. "Unclear. . . but I don't think so. Velocity's wrong. Wait." The crewman punched a few controls and pointed at his screen. "Confirmed -- Wyvern-class exo-armors on standard inbound attack vector." "Damn! Scramble the pilots. I want them out there now!" The ship was rocked by a large explosion as one of the exos opened fire with its massive arm-mounted gun. The attacker was blown in half as it turned to fire a second volley, its powerplant exploding in a blinding flash of light. A Stormrider exo-armor flashed a victory sign to the relieved bridge crew before heading off to hunt down the rest of the attackers.